Cat A vs Cat B Office Fit-Outs – What does this mean? For anyone unfamiliar with the various terminologies with commercial fit outs, Category A, Category B or even Shell and Core may seem like gobbledygook phrases! The fact is, when you understand their true meaning, the confusion quickly evaporates and what they entail becomes much clearer. As the name suggests, this simply refers to a building framework that appears complete from the outside, is watertight and is ready to have all services such as power, lighting and heating installed, interior walls boarded and plastered, floors in place and the interior fit out completed. It is what it states - a shell that represents a solid building structure but little else. Imagine a building stripped bare and gutted of any interior fittings, fixtures, electrical and mechanical works and you have a brickwork shell space and little else. To some this is not ideal but to others, it presents the perfect opportunity to have their design and build contractors completely fit-out the interior to their own specifications. So they're not restricted by what is in place already. This is one of the least common options you find for most businesses when moving office and is usually taken up by larger companies on bigger budgets, looking to fit out the space to their exact specifications and demands. Cat A is typically what you find when looking for an office space to rent that is ready to move into but only has the bare essentials. Usually, the mechanical and electrical services will all be in place such as electrical outlets, heating and air conditioning, toilets, raised access floors, suspended ceilings, fire protection systems and basic decorations applied to the walls in all the relevant rooms. A commercial space regarded as Category A tends to be a blank canvas and gives any new tenant a clean and useable office ready to move into but will lack any personality or customised interiors. Cat B is when things become far more interesting and you have turned your boring Cat A blank canvas into a space that reflects your businesses needs and image. This is the stage when you collaborate with your fit-out partner to design a style for your office space that could included a plethora of items including wall colours, floorings, furniture, door and window treatments, lighting, partitioning and more. A Cat B fit-out is about you and your design team identifying your needs by understanding your company culture, team size, work methods and protocols. It's a tailor-made solution that will be completely unique to you and your business that will combine style and creativity with application and substance. Fit outs like these can transform a business and bring your brand image to life. Fit outs like these distinguish the ordinary businesses from the dynamic and forward thinking. 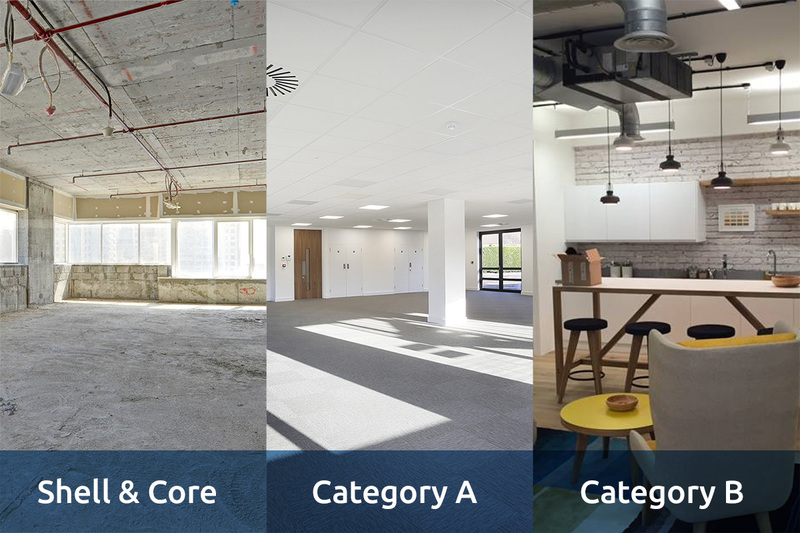 So now that we've successfully clarified the basic interior fit-out category jargon, you're now best placed to make an informed decision on how you prefer to seek your next commercial space and choose the option best suited to your company's needs. And if you need our guidance or advice on how to fit out your new office interior, feel free to drop us a line and we'll be happy to help!